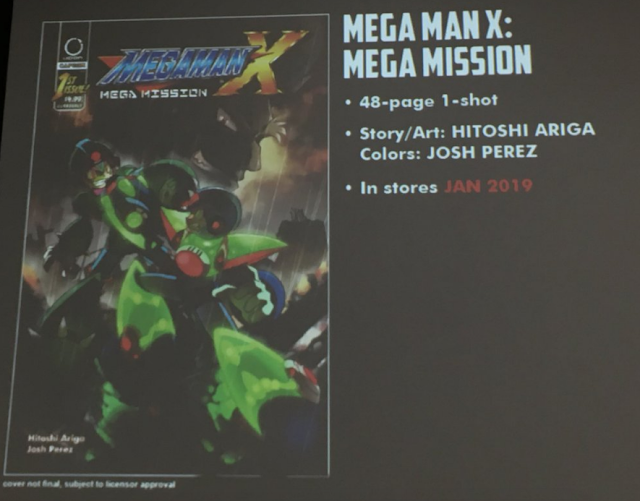 Previously unpublished in English, Hitoshi Ariga's Mega Man X: Mega Mission is *finally* headed stateside courtesy of UDON Entertainment. The publisher announced at SDCC '18 that the first full-color, 48-page issue arrives in January, 2019. Mega Mission was originally published in Hitoshi Ariga's Rockman Remix manga compilation in 1996. The story is an adaptation of the Mega Mission trading cards by Bandai, which chronicles a unique storyline that took place between Mega Man X2 and Mega Man X3. If you want to brush up on the cards' storyline before January, check out Number 20's coverage here. More news and additional images soon. Thanks to Deb Aoki for the picture! Well my day is complete. AWESOME! I'll be picking this up. I was always so confused about what those trading cards were. Cool. I'll look for it when it comes out. Any links to preorder yet, for real? The art and story in the Mega Mission trading cards was interesting. Glad to see it getting some attention stateside. I live in the UK how do get Master mix? That's awesome, i'm definitely going to get this if it's real. It's official, this is the Mega Man Renaissance era. neat. this is some good news, i'm going to get it. Well count this as the 7th Mega Man manga I get. I can hardly wait!